Gold standard and what happens without it! As it turned out, the “fiducia” or “trust” was misplaced, for in 1971 the US reneged on the Bretton Woods Agreements of 1944, “closed the gold window” and stiffed the creditor countries. 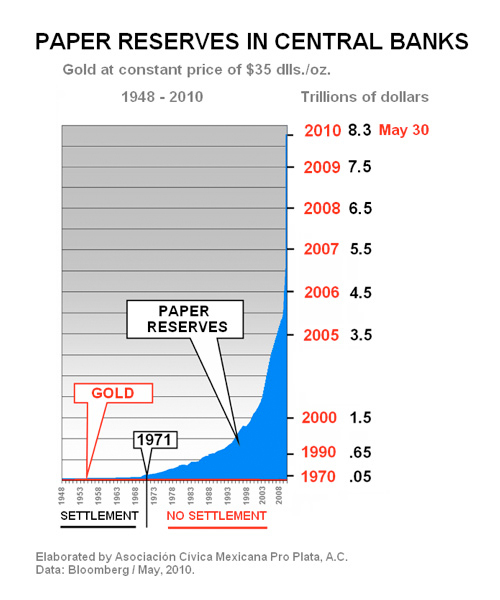 No final settlement of international commerce debts took place in 1971, nor has any taken place since then; the truth of this statement is obscured by the mistaken idea that tendering a fiat currency in payment of an international debt constitutes settlement of that debt. Once that false idea – that fiat money can settle a debt – is accepted as valid, then the problem of the enormous “imbalances” in world trade becomes an insoluble enigma. The best and brightest of today’s accredited economists attempt in vain to find a solution to a problem that cannot be solved except by the renewed use of gold as the international medium of commerce.